Our military moves us… we move our military. Ward North American is a proud U.S. Government approved service provider. Our many years of experience in providing services for all bureaus and branches of the government has earned us military personnel and their families trust. We offer cost-effective, full-service streamlined relocation programs and single-source management capabilities to ensure our heroes receive professional service tailored to the scope of their needs. As the official moving partner for the Gary Sinise Foundation, Ward North American supports and honors our wounded combat veterans by transporting furniture and appliances to Smart Home recipients at no cost. Every Move Matters. northAmerican® will proudly honor our military and build the USO partnership through the Every Move Matters Campaign. 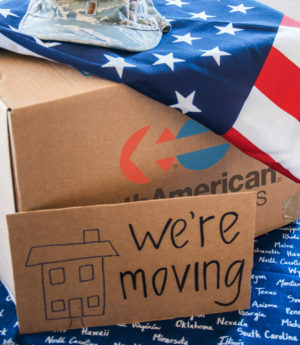 Starting March 20, 2017 northAmerican will donate $100 for every move booked through northamerican.com/uso - up to $100,000 - - to help support service members during their transition to civilian life.